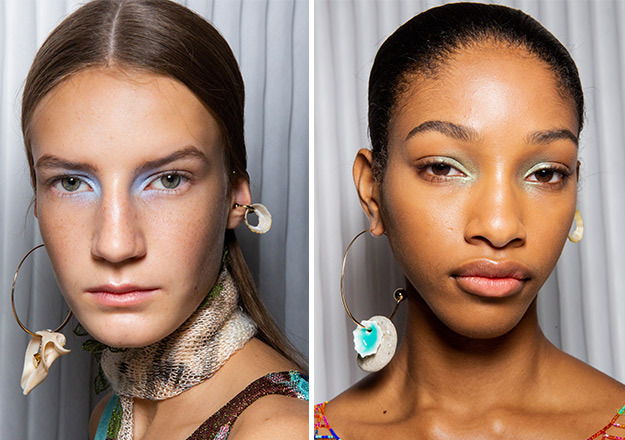 If you were taken by the plethora of awe-inspiring makeup looks spotted at London and New York Fashion Week earlier this month, Milan will blow your mind with some serious beauty inspo that you might want to save in your moodboard. The memo of the week was to go bold subtly—as ironic as this sounds, beauty gurus backstage proved that the new spring-ready look is one to score for next season. Plenty of the references hark back to beauty trends from past decades but with a modern twist, from Prada's '60s-leaning look replete with the chic-est faux bangs, to a '90s revival at Marco De Vincenzo in the form of jaw clips—the more the merrier. Giorgio Armani and Missoni offered fresh ways of wearing a daytime smoky eye, whether by way of smouldering pale hues or ethereal pastel shades. Below, which look are you from Milan Fashion Week SS19 are you most excited to try out? Giorgio Armani upgraded the spring smoky eye with shades of rose gold and lilac, coupled with a glossy pout that elevated the look altogether. Fendi's sleek top knots with face-framing tendrils are our new favourite fuss-free beauty look for busy mornings. Can't get enough of the comeback of jaw clips? Wear more than one on your head as demonstrated here at Marco De Vincenzo. 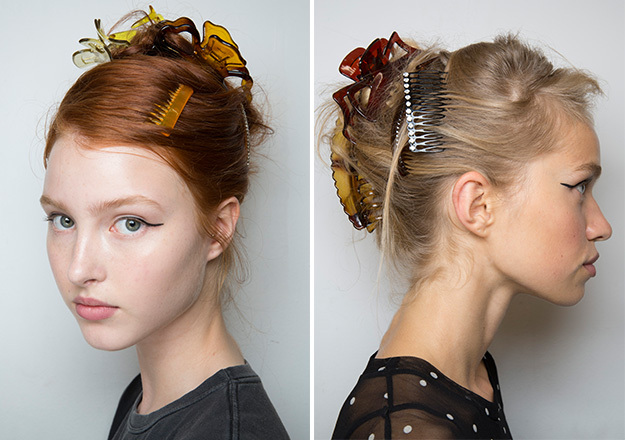 Tip: Throw in a bejewelled hair comb to keep all your loose strands in place. At Marni, it's all about drawing attention to your favourite features. Pull off an exaggerated graphic cat eye, or rock bold red lips to make a statement—don't forget to finish off with a wet mane. Missoni's go-to look was otherworldly as it was breathtaking—iridescent pastel eyeshadow in a form of a reverse smoky eye and luminous skin. The iconic Twiggy look gets a futuristic spin at Prada—spidery lashes were given extra oomph by way of drawn-on lashes, while choppy baby bangs and sizeable headbands let the eyes do all the talking. Makeup artist Pat McGrath gave us an inkling of how modern day heroines look like at Versace. Models sported a strong metallic cat eye with a pale pink lip—an arresting juxtaposition alongside middle-parted tresses secured with embellished clips. This article first published on BURO 24/7 Malaysia, which provides unparalleled coverage and access to the world of fashion, beauty, lifestyle, watches, and contemporary culture.